The Spectrum Max Promotional Ballpen is a very stylish retractable push-button ballpen with a triangular barrel, chrome trim and a comfortable rubber grip in a choice of 8 bright colours, Blue, Purple, Red, Yellow, Orange, Green, Black and White. 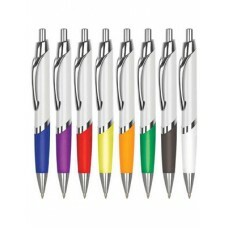 This promotional ballpen can print up to four colour printing and has a black ink refill as standard. Product Dimensions 140mm and print area is 45mm (w) x 10mm (h).